Whatever the reason, I think we all owe it to Duffy and his Scottie Mom and friends to hold our own Scottie kids tight tonight and give them lots of hugs in Duffy's memory. I've never lost a Scottie but I do remember the night I carried Mr. K into the emergency vet specialists in my arms, having to make the incredibly nerve-wracking decision to let go and trust complete strangers to care for your dog in the same manner in which you would. Then, there was that helpless feeling of knowing there is nothing to do but wait and hope against the odds that come with having a very sick puppy that the cards play out in your favor. It is a dreadful feeling that haunts me to this day, even after Mr. K has recovered and Heather seems to be on her way to a full recovery, too. We came so close to losing him that night and Heather too, months later, if the vet hadn't realized her symptoms were more than just a bladder infection. And yet, the pain lives on. Dear Duffy - When I think of what a hard year it has been for our family, I can only imagine what those like your Scottie Mom go through in times like this. It is comforting to know you brought her hours upon hours of joy and are resting peacefully now in a better place, filled with treats and back scratchings galore. I hope you were greeted by our other Scottie friends who have passed before you and I know you'll be there to greet the ones yet to come. Do look out for us from time to time and know the Scottie clan here on Earth will do the same for your Scottie Mom. Rest in peace, little guy. Much love from all of us Scottie Moms (and Dads) and the rest of the ArRRoOo crew. I lost my sweet Scottie, "Brindle", when she was six. 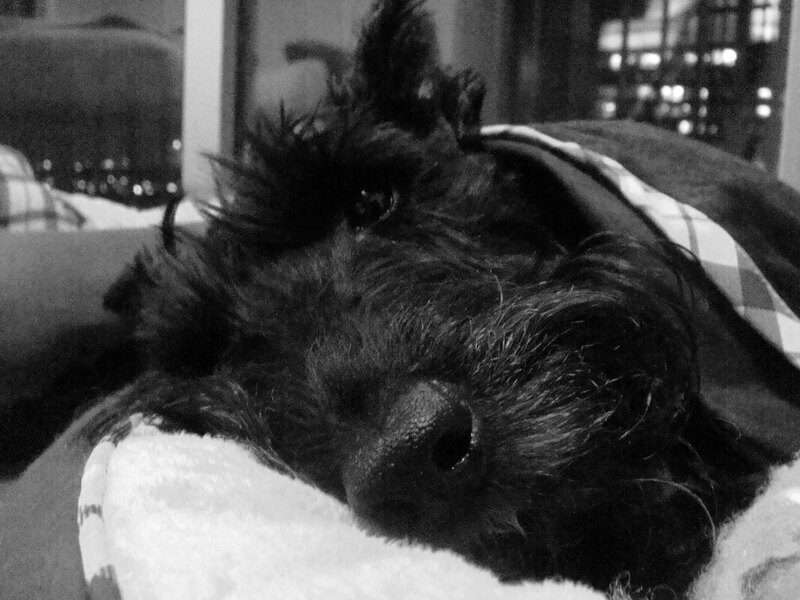 She had a blood disorder, and was never quite as healthy as her Scottie pals. She was so stoic. Such a special girl. I've had other dogs in my life, all of whom I loved verymuch, but a very, very special place in my heart is reserved for Brindle. My sympathies to Duffy's mom. Words are not adequate to convey how I know she's feeling right now. We lost our little Princess Tam Tam last year aged 4 months - I hope she knows how much she was loved by us all. Poor Duffy's family, I am crying as I sit here. We lost Duncan,Scottie dog #3 Oct. 29. He too was six & had diagnosed cancer for 3 months. York #4 was heartbroken like hubs & me. January 12 the hooligans joined us from the rescue section of Scottish Terrier Club America site. Mr. Pimms and our wheaten McGregor are now healing the hole in our heart. They seem to have come from terrible circumstances but now have a forever home. All of us are so grateful.